In 2014, the Russian space agency, Roskosmos, quietly replaced a highly advertised first launch of the nation's cosmonauts from the new space port in Vostochny with an automated space lab. The OKA-T module designed for periodic servicing by space station crews in orbit should've provided an exit strategy for the Russian space officials, who made an impossible promise to the Kremlin to fly a manned mission from the new space center in 2018. Since the 1990s, developers of the Russian segment of the International Space Station, ISS, have planned a module which would orbit the Earth in the vicinity of the main outpost. The OKA-T free-flying platform would be dedicated to ultra-sensitive material science experiments, which could be ruined by even smallest disturbances caused by movements of the crew if they were attempted inside the ISS proper. Instead, the serviceable platform would periodically dock at the main station, enabling crews to service equipment, unload samples and set up new experiments. The US and European engineers had studied similar spacecraft concepts since the dawn of the ISS program but none of them left the drawing board. After the euphoria of the 1980s, many big hopes for the production of unique alloys, semiconductors, optics and pharmaceuticals in the weightlessness of space turned out to be unworkable. In Russia, the OKA-T project had also lingered without much progress (or scientific justification). Around 2010, the launch was planned for 2015, however by the Fall of 2011, it had to be postponed to 2017-2018, due to lack of potential customers. (521) In April 2013, the launch was promised at the end of 2018. (634) By that time, circumstances suddenly made OKA-T a priority. As often in space program, these circumstances had little to do with science and almost everything to do with politics. 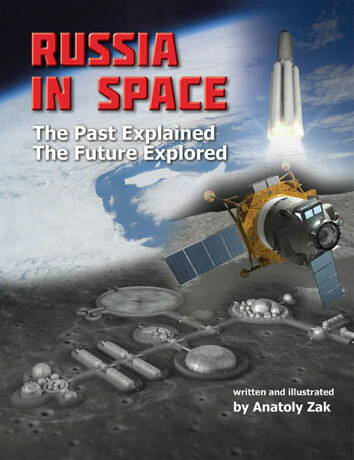 Since the foundation of the Vostochny launch site in 2007, the Kremlin and the official Russian media had advertised the first launch from the new space port in 2015, followed by a manned mission in 2018. Unable to introduce any new vehicles within this timeframe, Roskosmos made a decision to build a launch pad for the latest versions of the veteran Soyuz rocket at the site, with little justification but to meet the 2015 deadline. However, it created a new political problem in 2018, because the Soyuz rocket was deemed unable to carry its namesake manned spacecraft from Vostochny due to technical and safety problems. Nor was it powerful enough to launch a heavier next-generation transport. Roskosmos promised to build another pad in Vostochny for the Angara rocket, which could do the job, but the facility could not be completed before the end of this decade. Enter the OKA-T. Technically, it is a "manned" spacecraft, because it was designed to dock at the space station and cosmonauts can enter its pressurized compartment in orbit. 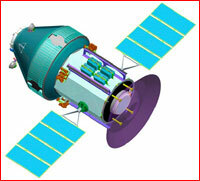 At the same time, it is launched unmanned and, with its eight-ton mass, the lab fits into the Soyuz-2-1b rocket! To camouflage their "little trick," Russian space officials began characterizing the 2018 milestone as the "first launch within the manned space program," instead of the first "manned launch," without specifying what exactly would fly from Vostochny in 2018. 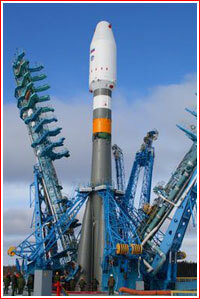 As a result, the official Russian media continued its cheerleading of the upcoming manned launch from Vostochny. In reality, no cosmonaut would be able to blast off from Vostochny until 2020s, when the new-generation spacecraft and the Angara-5 rocket are finally certified to carry a crew. Then, during Vladimir Putin's visit to Vostochny on Sept. 2, 2014, an official TV report caught a glimpse of a presentation handed out at a meeting chaired by the Russian president. 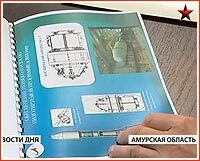 The document revealed drawings of the OKA-T module and the Soyuz-2 rocket under a title "Achieving the first launch within manned space program in 2018." On Sept. 29, 2014, just few weeks after the original posting of this story, a colorful reaction came from the Russian Deputy Prime Minister Dmitry Rogozin. During a meeting dedicated to the human space flight at the Gagarin Cosmonaut Training Center, Rogozin warned Roskosmos officials not even mention a possibility of delaying manned missions from Vostochny beyond 2018. "I would like to set a very important date, which nobody can doubt -- I mean the first manned launch from Vostochny in 2018," RIA Novosti quoted Rogozin as saying, "...There should be no lechery here, pardon me, because the talk is already starting on the subject," Rogozin was quoted as saying by RIA Novosti. The question remains how Russian space officials can get out of their predicament, since the launch of the next-generation spacecraft from Vostochny in 2018, as Rogozin demands, is utterly impossible. This fact has been perfectly known within the agency for quite some time and was actually discussed during a key internal strategy meeting in October 2013 chaired by the newly appointed head of Roskosmos Oleg Ostapenko. The only way out of the situation would be to change the plans yet again and bring old, good Soyuz spacecraft to Vostochny, instead of the next-generation spacecraft, PTK NP. However, such a move would require to duplicate all the Baikonur infrastructure for the Soyuz in Vostochny only to scrap it within few years with the arrival of PTK NP. Due to Vostochny's poorly suited location for manned launches and no ability to maneuver the descent capsule, Soyuz crews could face emergency landings in a rugged terrain of the Russian Far East or in the Pacific Ocean. The entire search and rescue network currently stretched along flat and open steppes of Kazakhstan would now have to be redeployed over the inhospitable taiga and mountains. Moreover, a fleet of sea-going rescue vessels would also have to be readied, reaching thousands of kilometers into the Pacific. Presumably, nominal landings would still be conducted in Kazakhstan or Southern Russia, therefore, a hugely expanded rescue network would have to be funded and maintained. However, Roskosmos bosses could claim that they had planned this all along and, as a result, save their heads from Rogozin's sword! However, such a "solution" would come at a price: an increased risk for Russian cosmonauts during launches and a waste of money on moving the Soyuz to Vostochny just to meet the 2018 deadline. During 2014, Roskosmos seemingly started preparing just for such a contingency, sending rescue teams to practice water landings in the Pacific Ocean and reviving long-abandoned mountain-climbing training for its cosmonauts. However, the agency was yet publicly mention that it had intended to bring the Soyuz spacecraft to Vostochny. In all their public statements, Russian officials are careful to stick with generic "manned launches" wording, instead of "Soyuz launches." Roskosmos leaders continued testing waters around the Kremlin trying to determine whether they could get away with the previous plan of launching the unmanned OKA-T module to the ISS in 2018 and deferring real manned missions from Vostochny until 2020s. 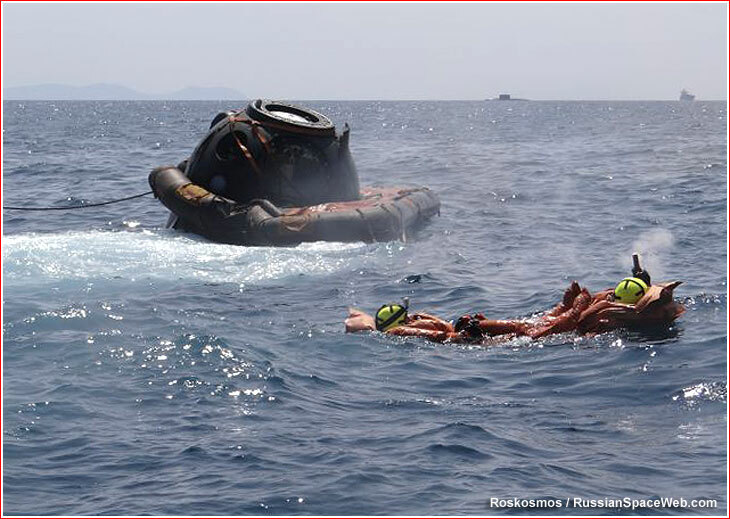 Above: Soyuz rescue teams practice off the Russian Pacific coast in August 2014. At the beginning of 2015, Roskosmos scheduled a single but risky launch of a manned Soyuz-MS spacecraft from Vostochny in 2019, just to meet the Kremlin's requirement to have cosmonauts flying from the new spaceport. Ironically, it would also be the first use of the Soyuz-2-1a rocket on a manned mission, because Soyuz-FG launchers, which are currently certified to carry crews, are incompatible with the new launch pad in Vostochny. To prepare the manned mission, two Progress cargo ships would be launched from Vostochny on Soyuz-2-1a rockets in 2018 and 2019. After "satisfying" this political goal with a single crew, all manned Soyuz and cargo Progress missions would then revert back to Baikonur for a safe ascent trajectory. The Soyuz spacecraft would continue flying two missions annually from Baikonur, until the veteran spacecraft's final launch in 2025. In 2021, Soyuz spacecraft missions originating from Baikonur would switch from Soyuz-FG to Soyuz-2-1a rocket. Within days, after a lone manned Soyuz mission from Vostochny appeared in Roskosmos' schedule dated April 4, 2015, space officials made a final appeal to the Kremlin to drop all Soyuz spacecraft launches from Vostochny. According to the Kommersant newspaper, the agency was granted its wish, however the official Kremlin spokesman then appeared denying this report but in a rather vague language. Clearly, with the "Soyuz launch from Vostochny" dilemma out of the way, Roskosmos also went ahead with the cancellation of the OKA-T project, which had failed to provide an adequate political alternative for this issue anyway. With the controversial scientific justification for the spacecraft and tightening budget at the agency at the end of 2014, Roskosmos cut OKA-T from the scaled back draft of the 10-year Federal Space Program, which the agency approved in April 2015. Russian plans in space revealed! 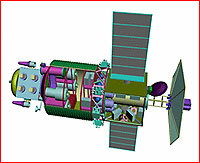 In 2012, in preparation for its future contigency plans, Roskosmos initiated a second phase of the preliminary design of the OKA-T spacecraft. It was officially conducted from August 2012 to Nov. 25, 2013. In its initial requirements, the agency asked the industry to evaluate a possibility of launching the spacecraft from Baikonur, Vostochny and Kourou, with a final decision on the launch site deferred until the completion of the preliminary design. The preliminary design reached the final stage in the Fall of 2013, but it took another year before its formal approval. On Oct. 31, 2014, the Chief Designer Council at RKK Energia held its meeting on the Russian segment of the International Space Station, ISS. Among other items on the agenda, the council approved the preliminary design of the OKA-T-MKS module, RKK Energia announced. 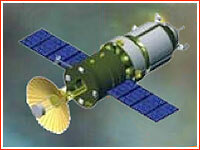 In this designation, "MKS" stood for the Russian designation of the ISS, denoting the module's destination. Russian planners indentified several fields of scientific research requiring pristine conditions of weightlessness or very high vacuum that could benefit from deployment onboard OKA-T platforms, as oppose to the rest of the Russian segment of the ISS or future permanently habitable outposts. Officials quoted the production of semi-conducting nano-structures, which would require levels of microgravity considerably higher than those possible onboard the ISS. The one field of material science which was considered to be a priority among possible experiments onboard OKA-T was the so-called molecular-beam epitaxy. The process requires the highest possible level of vacuum to grow semi-conductor crystals for nano-electronics. A presence even small number of particles, even those accompanying the International Space Station as a result of natural self-contamination, could be enough to disturb the process. To support the molecular-beam epitaxy onboard OKA-T, it would be equipped with a deployable shield protecting hyper-sensitive experiment from rarified air particles in the Earth orbit or any contaminants. A similar device was tried briefly onboard the Space Shuttle. In addition to epitaxy, the production of cartilaginous tissue for medical research, new alloys for latest-generation sensors and biologically active chemicals with superior qualities than those possible on the ground were also quoted as possible fields of research onboard OKA-T. In June 2013, Thomas Reiter, the head of the manned programs at the European Space Agency, ESA, told RIA Novosti that his agency had been discussing a possible cooperation with Roskosmos on the OKA-T project. During two decades since the concept of a free-flying companion to the ISS had first been introduced by the Russian space agency, OKA-T took many shapes and forms, all of them on paper. 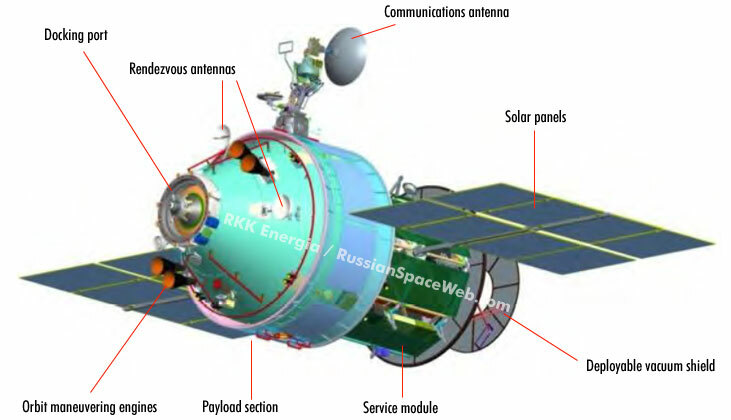 Engineers at RKK Energia relied in their designs on the habitation module of the Soyuz spacecraft and on the Progress cargo ship. 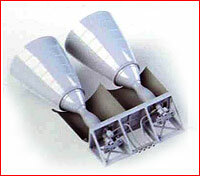 One concept proposed around 2000, featured a pressurized module and a large airlock containing an umbrealla like structure intended to protect sensitive experiments from external contaminants during the exposure to the vacuum of space. There was also an idea to equip the spacecraft with a series of small capsules, which could parachute back to Earth with the results of experiments. The concept apparently originated at TsSKB Progress, which used a similar design to return exposed film from its spy satellites. By the time, the project got its first chance to appear in metal, it was decided to use a common architecture with the next-generation PTK NP spacecraft. The spacecraft would include a payload compartment for experiments and an airlock chamber. According to the 2012 technical assignment for the preliminary design of the OKA-T platform, it was supposed to be a spacecraft capable of operating in space for up to seven years with 80 percent of that time dedicated to scientific experiments. Between fully autonomous missions lasting from three to six months, OKA-T would dock at the ISS two or three times a year for a week-long refurbishment by the station crews and refueling of its propulsion system. Dockings with the PTK NP spacecraft would also be possible. The 2012 assignment also boosted the platform's solar-producing power from 3.5 to 5 kilowatts and increased its mass from 7.8 to 8 tons. Roskosmos also required the spacecraft to have a capability to climb as far as "3,000 kilometers or even higher" above the Earth surface using its own engines. Roskosmos did not explain the purpose of such a high "flight ceiling" for the OKA-T.
During its free flight, the platform would have to be able to drift without even slightest acceleration for as long as 20 days, providing ideal microgravity conditions for onboard experiments. During this time, sensitive experiments would be deployed into open space through a 0.8-meter hatch from a special 1.5-meter airlock and behind an umbrella shield reaching 2.5 meters in diameter. The assignment specified that the shield would have to exceed the main diameter of the spacecraft by at least 200 millimeters to provide a "wake" clear of any contamination from the spacecraft itself. A pressurized compartment would carry its own experiments housed in standard racks similar to those onboard the ISS. The OKA-T platform would be able to coordinate its formation flying with the ISS via Russian GLONASS global positioning satellites. 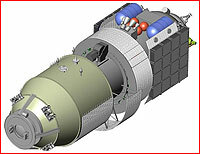 The earlier idea of delivering result of experiments from OKA-T directly to Earth inside special capsules was abandoned in favor of unloading all the materials onboard the ISS. Experiments could then be shipped back to Earth by other means. The FKP-2025 documents also provisioned eventual upgrades of the OKA-T-2 module and other components of the next-generation space station for a possible use with the Lunar Orbital Station, LOS, providing an outpost in the orbit around the Moon. A special robotic arm system conceived for the Lunar Orbital Station could be first tested onboard OKA-T-2.